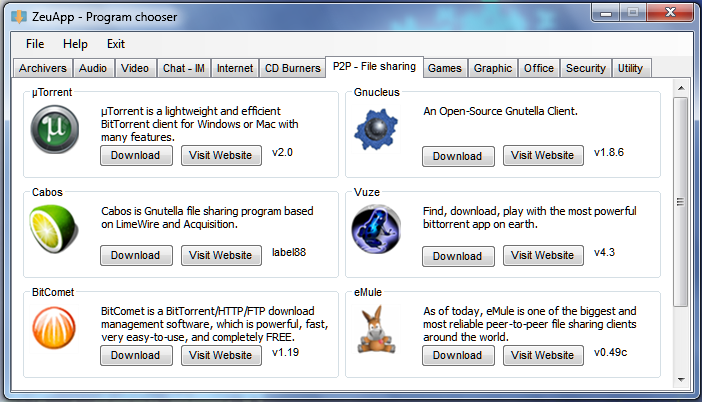 If your setting up a new computer or looking for a way to find the best Open Source apps look no further, ZeuAPP is a portable installation tool for nearly a hundred applications. ZeuAPP is essentially an installation dashboard for 82 applications. You can search to application types like CD Burners, P2P apps, Office apps, and more. Under each section are applications for that category with a “Download” and “Visit Website” buttons which allows you to download the application and automatically launch the installer or visit the web site for more info about the app. ZeuAPP is freeware, portable, and Windows only!